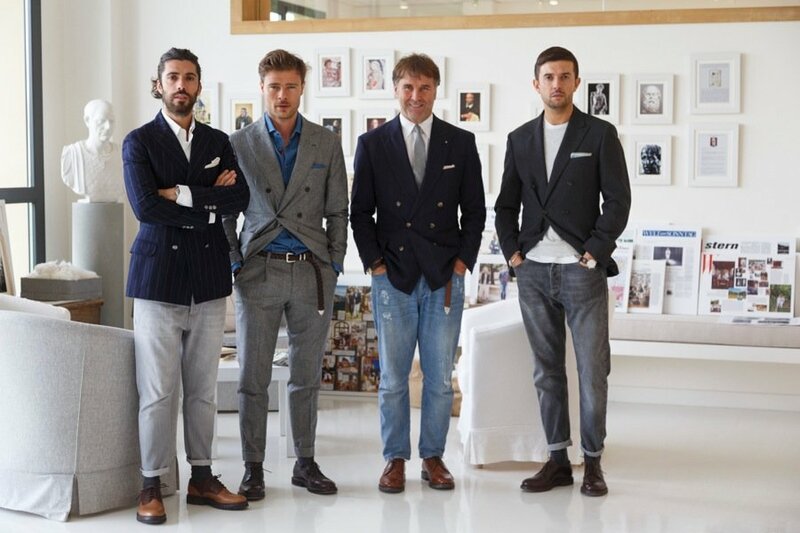 A few weeks ago I was invited by Brunello Cucinelli to visit the HQ in Solomeo. Perhaps surprisingly, when I interviewed him Brunello was one of the most open and unpretentious people I’ve met. He was creative and honest; grounded yet passionate. In the interview we focused on style - the aspect of the Cucinelli brand I think most interesting (consciously avoiding any discussion of pricing, quality or philosophy). And so we spent most of the time in the creative studio, with a couple of his team (pictured below) and clothes scattered across the floor. On two occasions the translator and I had to turn quickly away as he changed his trousers - in order to swap denim for flannel and demonstrate a point about texture. There are some aspects of the Cucinelli style we all like and have been highly influential - essentially bringing the old Italian textures of navy tailoring, grey cashmere and brown suede to a global audience. But I'd argue many others are completely at odds with traditional style. Most noticeably, the mixing of very formal and informal items (often in order to subvert expectations). While this isn’t my taste, I've always been interested in how brands like Cucinelli formalise such styles in order to apply them consistently. What rules do they have? What can change and what cannot? And so I asked Brunello to rationalise his style in the same way we do with more classic menswear every day. Permanent Style: What piece do you start with when you assemble an outfit? Brunello Cucinelli: The jacket, always. It must well made, and the fit must be perfect. So when you undo the waist button, for example, the jacket must stay in place, it mustn't wander about. That keeps the flattering fit through the waist, and enhances the chest. And for my style, the jacket must have a contemporary cut. That means a little shorter, with what we call a one-and-a-half breast - a small gap between the buttons on a double breasted. That keeps the look slim, narrow. Our tailors in Italy are very good, we have some of the best. But personally I think they have a tendency to make the shoulders too wide, to impose a look on the body, rather than flatter what's already there. So, always the jacket first. Then below the waist. When I wear jeans, as I am today, I always wear a tie. You’d always wear a tie with jeans, even though the tie makes the outfit smarter? Yes. In the same way I never wear denim with a jumper, or denim with sneakers. It's too sporty. You need to balance the two sides. Always the same kind of tie? Yes, pretty much. It's wool or sometimes cotton. The texture might change - wool vs cashmere. And I have four or five different shades of grey, two or three of blue. But always solids in one of those two colours. The shoes must also be beautiful, good leather, nicely made. Mostly shades of brown - this dark brown or a slightly lighter shade. But they're also relatively casual shoes, with a thickish sole, a derby style. Yes, that's a good point. But they're still a long way from sneakers. They're smart. Sneakers and denim never works for me. Why do you like this look so much? Age has a big part to do with it. I'm 65; I couldn't just wear a normal suit, a nice shirt and tie. Because I don't want to look that old - I want to look at least 10 years younger. It's easier for you in many ways, in your brown-linen suit, shoes and tie. You're not concerned with looking older. In many ways the young can wear anything. But this look, the jeans and tailoring, is for anyone. If I cover my face, if you just look at my clothes, you would have no idea what age I was - I could be 20, I could be 60. That's one thing we do when we're developing the collections. My assistants and I line up, guys in their late 20s, into their 30s, and me in my 60s - and see what things look like on different ages. OK, and then how would you change this outfit for a more formal occasion? I think this outfit you could wear most places, and you would look chic. Not to Wall Street of course, but to university, at the office, in town. You would look elegant but not too fussy. But if you were going to a smarter occasion, you could swap the denim for grey wool trousers. A lightweight wool for the season. In that case, it would be the fit that would keep it contemporary - this outfit would rely more on the fit for that effect. The jacket is already good, but the fit of the trousers becomes very important. The length must be perfect, just like yours. And with this brown linen jacket, I'm wearing wool trousers - always wool on the trouser with linen on the top, to keep that contrast in texture. Again, the look is ageless. I could be 30, I could be 60. And it's not that classic if you look closely, just nicely tailored. And would you adjust other parts of the outfit - like the material of the shirt? No, it's interesting but I usually like a more formal shirt material. It's balanced by being a button-down, and of course by the wool tie. You might substitute a denim shirt for the white, if you wanted to be sportier, but that's all. Ah yes, so here perhaps this camel-coloured vicuna coat. Worn over the top, perhaps even with just knitwear underneath. I wear the collar up, the top buttons fastened. This vicuna coat is an old one of my own, but we’re also introducing a similar one this season - just in a fuzzier, thick wool. It has a grey cast to it, and far more texture. That makes it much easier to wear with sportier clothing. On the point about trouser style, do you think this will change over time? Do you think a short, 20.7cm trouser will achieve your aim of looking contemporary now - but that will change in five years? Possibly, but these things do change very slowly. When we started we were the first to be rolling the bottom of the trousers up, now everyone is doing it. The trouser might change - we use more pleats now than we used to - but it’s a slow change and an easy one for a man to keep on top of. How would you describe the colours you use? Muted, earthy? Yes, exactly - muted, natural. We are looking at doing it now, but we haven’t really used strong colours for more than 10 years. Always these very natural, subtle colours. When we do have colour often it will be in a little accent, like the spot on a handkerchief, or the lining of a jacket. These kind of accents are like a handbag for a woman. We have just those to play with, plus a watch. And a lot of emphasis on texture? Yes, on soft, rich textures. Flannels and suede. It’s not showy but it looks luxurious and valuable. This is what I want to achieve with my clothing - this subtle luxury. I learned this from the English - and you’ll have to accept the compliment this time. The English are the masters of conservative dress, it all stems from you and runs out, filtering down here to Solomeo. You can follow the discussion on Interview: Brunello Cucinelli on formal/informal style by entering your email address in the box below. You will then receive an email every time a new comment is added. These will also contain a link to a page where you can stop the alerts, and remove all of your related data from the site. 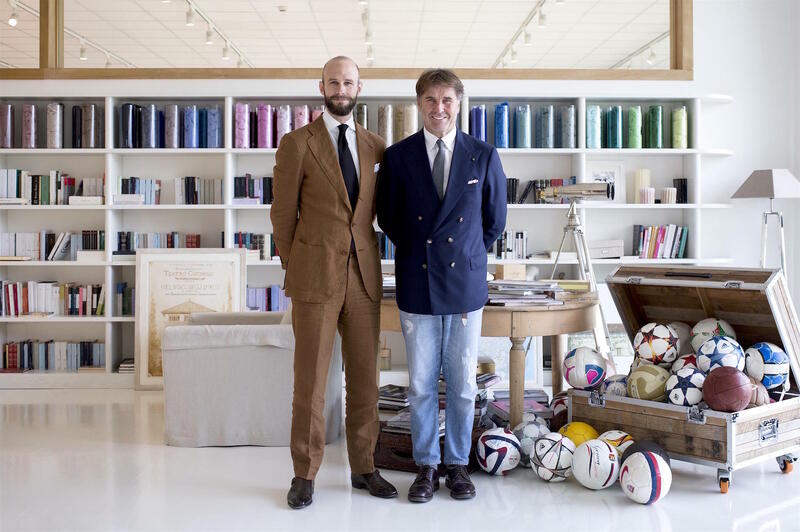 Quite interesting interview about the style of one of the trendsetter italian brands, Simon, but as you anticipate, readers will miss some points about quality in the post, in order to evaluate how BC compares with similar brands. As far as I know (maybe I’m wrong) BC does not have handmade buttonholes in their suits and jackets, something I find astonishing at their price range, for sure his suitmaker is able to do it, (the usual suspects are Caruso, Scuderi, Belvest or Partenopea). This is indicative of the public they want to address (not the sartorial one, definitely). Completely off topic, but could you provide us with your usual supplier of Bresciani socks? I’ve been purchasing them from MCS, Berg&Berg and Shibumi, but the materials and colours available are not very consistent. While MCS have not any of the basic models, Berg&Berg only supplies wool models currently and Shibumi has the cottons out of stock. (BTW, I recently realized that Shibumi offer is the wide ribbed cotton model, thicker than those ones I purchased from Berg&Berg, so they are not suitable for the warmer months). Quite an odyssey to just buy the socks when you need them, completely different experience as with Zimmerli, just to compare. Yes I’d argue the quality should be higher – but now they own the Avenza factory it certainly could be. I like this article for the open minded perspective that comes across in it especially given that, as you say, his philosophy and yours are not fully aligned. I’d love to see him in the brown linen suit that he thinks your relative youth means he can’t pull off and you can. I think it would look rather good on him and actually detract better from his age. The dressing for age thing is getting, sadly, more relevant for me, but I am rather tired of reading the same article about this in the usual crop of magazines – you know the one with the picture of Bill Nighy in a blue suit for the older guy bit. Although he is older than me! It would be interesting to hear some other perspectives on keeping it fresh and interesting when you get a bit older. My thinking is that as you age body shape is actually much more the determinant of what works than actual age – although there are limits! A very interesting point from Nigel C regarding the elegantly ageing hipster. There is certainly more sartorial inspirations than Bill Nighy albeit he does plough his particular furrow well. His look suits him and that’s the point. Cucinelli’s look doesn’t suit him or, anybody else for that matter. It’s just a sartorial car crash. Personally I think the trick to ageing gracefully is basically just to constantly refine your look without changing it. I say this because if you haven’t cracked the code by the time you have a couple of greys, you never will. Surely everybody that haunts this hallowed sartorial hall can tell the difference between Charlie Watts and Mick Jagger. Charlie gets it and is one of the best dressed guys in town – any age. Mick still thinks he is 19 and the only time he ever looks good is when somebody else dresses him (as Bianca did for his first wedding). Other great mature style gurus are Ferry, Ralph Fiennes and Jeremy Irons. They all are great individualists with fabulous taste. As another 50 plus guy I agree that body shape says a lot about what works. I’m still slim (genes and luck mostly) so the slim cuts of the past few years have worked very well for me. I do try to avoid looking like I’m trying to deny my age. So the distressed jeans look is a no-go for me. If my jeans are torn that’s because I’ve torn them gardening or camping. Putting torn jeans on with a tailored jacket says “I haven’t done the laundry in quite a while”. So I keep it simple; clothing that fits, colours that suit my skin and hair (blues, greys and browns), nothing to trendy and nothing too studied. I think Simon has it right in posts where he says you should be at home in your clothes (and in your own skin). By 50 most of us should at least be comfortable in our own skin. David Evans at the Grey Fox blog has done some exploring of what style can mean for a “mature” man. Brunello looks like he is trying way too hard, with his uber-distressed jeans and fashionable scuzz coupled with that staple of traditional elegance, the double-breasted navy blazer. At 65, he should know better and stop trying to look like a 30-something assistant professor. And what’s with the rolled-up trousers? I really like the narrow wrap of the “one-and-a-half breast” jackets. But I find that the outfits these men put together lack elegance. With short jackets and low rise trousers they look like they outgrew their clothes. Though I now understand the reasoning behind Cucinelli’s fashion choices, the outfits just look sloppy. I like the style of cucinelli , they have very good ideas. But quality, fit and price tags are awful. I agree that the sartorial mullet looks bad regardless of whether you are 20 or 60! Dressing one’s age is not a bad rule to follow as rules go. True! Can anyone imagine Cary Grant, or Sean Connery as 007, or JFK, or any other elegant grown-up we can think of wearing rolled-up distressed jeans with an elegant blazer and tie? Are we looking at the same pictures, Mr Cucinelli’s jeans are not rolled-up. I stand corrected – the other models have rolled-up jeans; Brunello’s jeans are simply very short. Keeping away from the small details like buttonholes and more to the overall style theme there are some very interesting ideas in here. Where I can’t venture are the short, half-mast trousers and especially the formal top half -DB jacket, shirt, tie with the casual, distressed jeans look below. To me that looks like two outfits slapped together. I believe this is what you termed in a previous article the ‘newsreader’ look, Simon? I like the idea of contrasts though but perhaps done more subtly; an informal shirt material, wool tie etc with the jacket. That masking your age thing too – you can’t go round with a bag on your head so once you reach a “certain age” you do have to think about combinations of clothing as being inappropriate, stylish and in keeping etc. Interesting article, but I can’t imagine you going for any of those outfits Simon. Brunello’s distressed jeans + DB coat + tie is particularly weird. It seems the opposite of sprezzatura – too mannered and deliberate. Is it just me but the 4 “gentlemen” look like they have dressed out of a Salvation Army thrift box. I understand the concept of the look they are trying to achieve..I wore the same look in the 70’s (see Robert Redford in “3 Days of the Condor). But…the clothes simply do not fit..they do not flow. They chop up the body into completely unrelated segments. I must admit however that Cucinelli has huge “cojones” to charge the prices he does and get away with it. Even more surprising is that men are prepared to pay exorbitant amounts for clothing of dubious style and quality. Good article …. a subject not really touched in for a long time . My thoughts …. as previously said the navy double breasted with the faded jeans condemn a person to the newsreader / Jeremy Clarkson look . The problem with throwing on a good jacket with faded jeans is the contrast is too extreme. Jeans fade , jackets don’t . The only way I see it working is with dark raw denim . The rolled up trousers …. I thought only the British did this . Either way it looks like fashion not ‘permanent style’. The casual suit look is the only one that really works . Once again very good topic. This is a very interesting interview. The style Brunello Cucinelli is promoting is consistent and unmistakable indeed! Combining formal and informal clothing made style is at the heart of his brand. Could one call it smart casual? Easily the most interesting and stylish brand out there at the moment in my opinion. The entire look isn’t and won’t work for and on everyone but go to Italy where BC is from and look at the way that stylish off duty men dress there…. and it’s very similar in my opinion atleast. Look at suit supply and their lifestyle options in their shop windows – I know they aren’t an authority on menswear but they’re enormously popular. I must say, it’s refreshing to read a peace on Cucinelli not focused on the philosophy and pricing. I really liked his looks from the earlier years, great knitwear and odd jackets in corduroy, tweed etc with cargos, I really do think that works well in a casual environment. Great use of texture and color (and sometimes lack there off). However the latest lookbooks are not at all as appealing, at least to me. Touching on the man himself, ironically I find the combination of a smart worsted jacket and distressed denim with a hanging belt makes him look like he’s 10 years older trying way too hard to stay hip than young or timeless. Each to his own of course, but swapping the jacket for something with a bit more texture, even a hopsack, would improve immensely. Personally I’d go with a herringbone or a heavy cotton, but then again, that would really take away from the formal elements he obviously aspire too. A very interesting interview. I’ve read many interviews with BC, which often seem more interested in his Solomeo projects than how he creates his look. There are some revealing insights too. I interpret his comment about not wearing a jumper with jeans as meaning not that it can’t be done, but that this would not be his look. His look needs formal elements in a casual outfit as much as it needs informal touches in a formal outfit. I think the designers look great in these photos. I particularly like the man who has worn a double breasted flannel suit in a very casual way, with a dark shirt , western belt and chunky brogues. I aspire to a wardrobe of clothes that are timeless and well loved, as much as the next PS reader, however there is something incredibly warm and satisfying in Cucinelli’s clothing. The Brad Pitt look-alike has made the best choices. Interesting to see these twentysomething designers dressed in a style that is supposed to make one look at least ten years younger. An interesting discussion with a fine businessman. The more wealth one accumulates, the less formal one becomes. MCS – Mes Chaussettes Rouges? I fondly remember the occasion I stumbled across this brand in the late 90s/early 00s in a small store in Taormina. At the time it was a wonderful and welcome change of air from the 90s fashion. It really was everything that the master mentions here, warm colours, thick cords , heavy jumpers and soft flannels. Even though it was expensive , tha quality felt worth it . This continued to the mid 00s when a beautiful catalogue shot in some old Italian univerity came out. The pictures really epitomized what Cucinelli wanted his brand to be. Since then the brand has changed. The prices went one way, the quality another. Boutiques started popping up everywhere and the looks turned from classic understatement to strangeley disshelved. The quality of my last jumper bought some 5 years ago, really left me indifferent to the whole brand and was in no way comparable to items I first bought. It’s a shame but I guss that’s the way things go, when marketing people get their will and cashing in is more important than maintaining quality and longevity. I love BC. For me, having tried knitwear from numerous brands – Loro Piana, A&S etc – it’s BY FAR the best quality. I still have every piece that I ever bought and still wear them. The quality, style etc have remained remarkably consistent for a high end fashion brand. He obviously presents his own version of a style or aesthetic that he likes and that suits him, but the pieces stand alone in terms of their quality and style. One thing I would love to hear more from him on is the business side of what he does – I am fascinated by how successful he has been. Also, a shout out to his team at his Burlington Gardens store in London – one of the very best retail experiences you can have. I distinctly disagree, also Loro Piana knitwear is in my experience superior to Cucinelli. I know two store owners who used to carry Cucinelli and they both agree that they’ve declined in quality, which was also admitted by their sales rep for my country. Both ended up dropping the brand because they couldn’t compete with the changed managment style and the agressive sales of Cucinelli’s own boutiques. If I compare their jumpers and jackets from almost 20 years ago to their current collection it is painfully obvious that the quality hasn’t changed for the better. I wore a pair of 12 year old cotton trousers today and they don’t compare to anything they have in stock today. You must be one of their only customers in Burlington Gardens. San Carlo probably has more visitors! This post highlights the difference between a fashion business (and their need to produce changing seasonal collections) with ‘Permanent Style’. People visit G&H, Huntsman, A&S, etc. because they like and understand the house style and although it may change slightly over the years, a navy blazer from one of these establishments will remain similar in cut and style for 20 or 30 years. Mr Cucinelli wants his customers to by a new (and different) blazer from him each season and needs to alter the look each time accordingly. I would suggest (as with all fashion businesses) that buying a single high quality piece like a cashmere cardigan or a blazer or overcoat and adding it to your ‘timeless’ and tailored wardrobe will produce the best results. In my opinion the models shown are compromised by wearing a ‘complete look’ from one designer – this sadly makes it appear like a Cucinelli ‘uniform’ rather than a style, particularly when they all stand together. What I would have loved to see in your profile, Simon, was something beyond the norm of the hundreds of other Cucinelli pieces written for Bloomberg or The New York Times, etc. Why not look at his use of d’Avenza tailors to up his bespoke and MTM suit game? What’s happened to d’Avenza since BC has annexed those skilled craftsmen? What’s happened to the quality of BC’s tailored pieces since that time? How does BC maintain quality controls of his cashmere product when it seems to be plentiful (almost “mass produced” in its sheer volume)? I’m also curious to know your (Simon’s) thoughts on who is wearing BC. I live in NYC and I do not see men wearing double breasted suits, nor do I see men wearing DB blazers or sport coats. I don’t see men wearing rolled up trousers, jeans, or the like. Again, I love the idea of a hand-made, naturalistic product, that has philosophical underpinnings…but once you get to the product itself: (as everyone has mentioned) – the price, the lack of commensurate quality, and the growing ubiquity of the product…the intrinsic appeal of BC remains unclear to me. I would rather buy a 100% cashmere sweater from Cruciani for $120 on sale, than spend $800 on a BC piece. I’ve owned two cashmere sweaters from BC: one was scratchy – and the other one was not “soft.” Both were disappointing (even if they’d been a quarter of the price). 1. More content. Do you enough material for a series here? As many others have posted – the rolled up pant legs…- yuck! On the dangling belt tail – isn’t there some “rule” that something like this that could cause danger – as in being caught in machinery – that should negate this particular detail? As a fan of all things BC, (and although, even as an American, I VERY much appreciate Classic British tailoring; owning some A&S, Richard Anderson, even Tommy Nutter!,) I find this interview to be not only informative, but enlightening. There are those here who denigrate his style; I must say that the proof is in the pudding, to coin a phrase: Wear one of his jackets for a day and tell me if you don’t feel better; actually, physically, better. Or one of his ties, together with one of his shirts, and tell me you don’t FEEL the passion that went into the making of said articles. I realize that the jeans with sport coat look isn’t for everyone, or that he looks, as one reader said, like an “aging hipster”. I can only say this: The educated enthusiast I am becomes re-ignited when I wear a pair of his trousers, or a coat made by his company Given his philosophies, interests, and the magnificent work environment with which he provides his employees, one can physically BE in one of his creations. Thank you for this interview; very edifying. DS from LA. I own many BC jeans, pants, cashmere sweaters. I get them at a very discounted price. But I dont subscribe to that ‘”Pretty In Pink” look. A BC sport coat deserves clean and immaculate jeans. Besides, I already lived the 80s ! Bruno and the Jeans: like art in the museum that stirs emotion/debate/thought. My impression is he’s very genuine, and clever. Bruno put ’em on and we’re all talking about it.